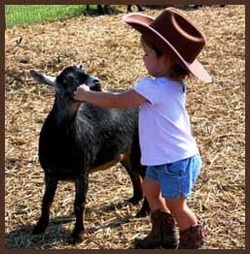 The River Ranch petting zoo offers a collection of animals that one would find on a typical ranch, be it in the 1800's or today. Animals are an important part of a rancher's life, especially in the 1800's. Animals provided a means of food and clothing. Chickens (though we don't have any at the time) laid eggs and provided a source of meat for the family and they also ate devastating garden bugs that could destroy a rancher's garden. Sheep gave wool for clothing, goats provided milk and dairy products and a source of meat. Pigs provided a supply of meat and leather as well that could be sold to the local town's market for redistribution. Dogs provided protection over the herds of sheep, goats or chickens and also served as a companion to the family. Without these necessary animals, not only ranchers, but their family, the town's people that lived in the surrounding community and the people who moved westward from the east coast, would not have survived. Everyone in those small local surrounding towns benefited from the farmer and rancher's animals, and as such, animals were highly prized. If someone was caught stealing an animal from another rancher or farmer, they would be caught, charged and put in jail, often with devastating results. Though this way of life has long since passed, animals are still a fundamental part of life. Here on our ranch, our animals are strictly for petting and loving on and are considered part of the family. Many of our animals have names (usually more than one) and have been socialized to adults and children. Their temperaments and size makes them particularly great for teaching children about animal sciences and animal studies, with respect to farm life. We hope you enjoy our petting zoo and learning about the different types of animals found on a farm. We would love to see your pictures and hear your tales about your visit to our zoo.